Grecotel Caramel Boutique offers guests a fantastic range of activities and amenities in a chic, elegant setting. It’s close to Rethymnon where you’ll find historic buildings and ruins as well as plenty to do. Located on a 300m stretch of golden sands and with a large infinity pool and onsite spa, there are plenty of opportunities to simply relax and unwind during your stay. Guests will love the modern décor and comfortable surroundings, including landscaped gardens and day beds around the pool. 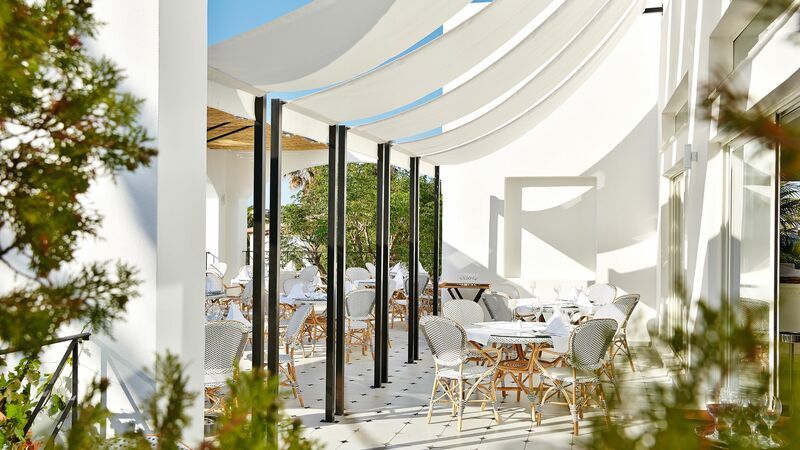 When it comes to dining children have their very own area, while adults will love the excellent selection of eateries, including access to other Grecotel restaurants in the nearby area. And if you want to keep active there are watersports, land sports, and more available. Hotel child prices apply to ages 2–13 years. The hotel has 69 rooms. 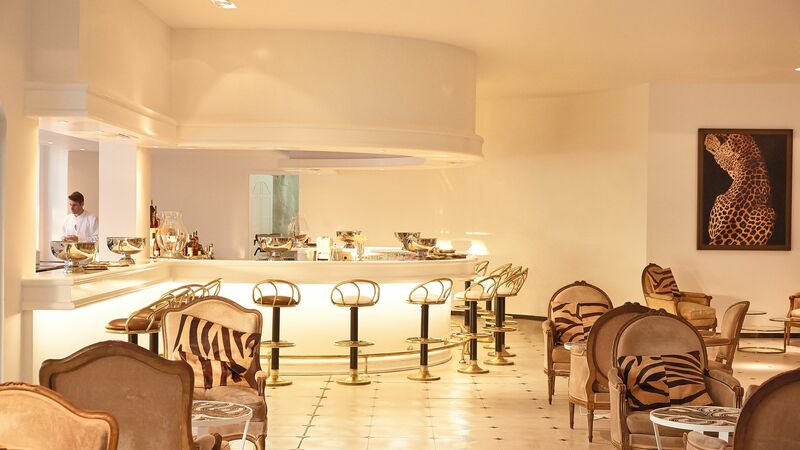 The chic design of this elegant restaurant is inspired by colonial décor and provides a tranquil atmosphere. Choose from fitness food, show cooking and a hot and cold buffet. Cover ups are required for breakfast and shoes must be worn. No beachwear or shorts are permitted in the evening. Overlooking the beautiful main swimming pool, this is the perfect place to enjoy drinks, snacks and meals all day. There are also special menus for children. Choose from delicious succulent fish and seafood dishes with Mediterranean flavours. No beachwear or shorts are permitted in the restaurant in the evening. Take in views of the swimming pool or relax in cool interiors as you choose from cocktails, teas and coffees and listen to the ambient live music. No beachwear or shorts are permitted in the bar in the evening. Shoes must be worn at all times. Located close to Rethymnon, this 40-hectare farm has a beautiful stone farmhouse and an expanse of fields and orchards growing delicious fresh produce. Choose the six course tasting menu for the ultimate dining experience. Overlooking vineyards and olive groves from its hilltop location, this traditional Greek stone building offers an excellent atmosphere and some spectacular traditional Cretan dishes. Open: 18:00–late Tuesday to Saturday and 11:00–late Sundays from May to October. This restaurant is located at Agreco Farm. Located close to the golden sandy beach and surrounded by palm trees, this pretty restaurant serves up fresh local seafood combined with Mediterranean platters. No beachwear or shorts are permitted in the restaurant. The restaurant is located at nearby Grecotel Creta Palace. Located on the rooftop, enjoy spectacular views of the surrounding landscapes as you take in the chic ambience of this restaurant and bar. 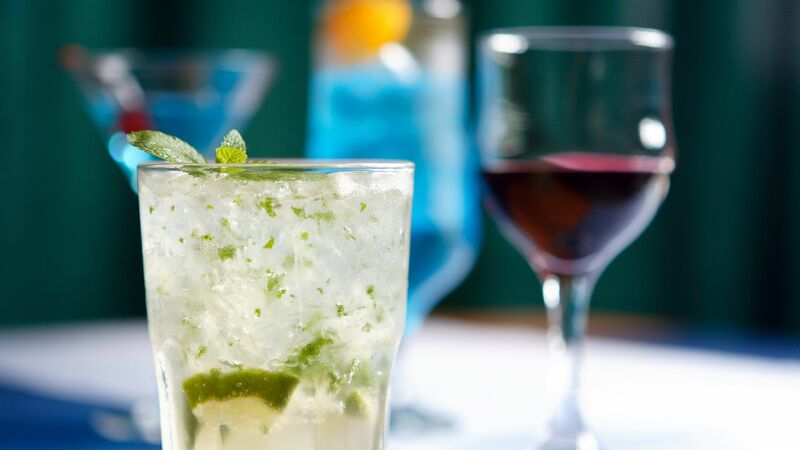 The menu includes light bites and delicious cocktails, wines and more. Enjoy modern takes on Asian classics in this beautifully designed restaurant. Options include sushi, noodles and spring rolls. Take in views of the sparkling sea or chic interiors as you choose from menus featuring French, Greek and Italian dishes. Seafood and delicious wines from the extensive cellar are a must. Guests under the age of 12 are not permitted at this restaurant. The White is located at nearby Grecotel White Palace. This trendy restaurant offers beautiful views from its floor length windows, with rustic details and elegant touches inspired by Picasso. Dine on the terrace which floats on the infinity pool and take in views of the sea as you enjoy classic Italian cuisine. The restaurant is located at nearby Grecotel White Palace. 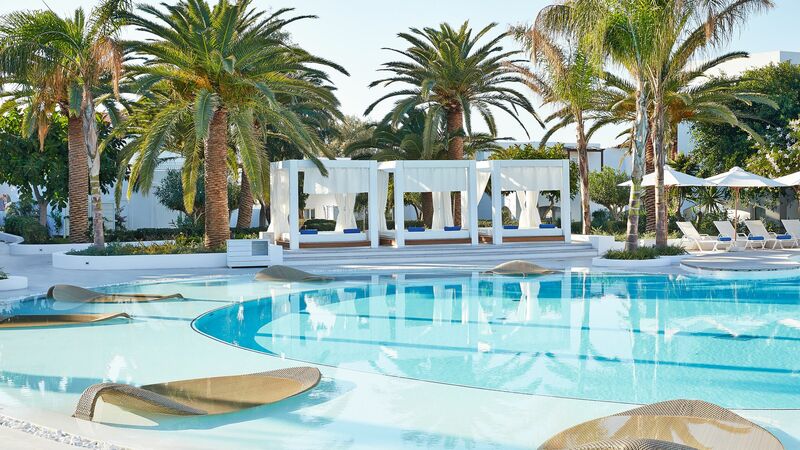 The 300m beach in front of the Grecotel Caramel Boutique offers sun beds and cabanas, towels, and a lounger service. The large seawater swimming pool has an elegant design, based on a lily pad, with light shows and fountains in the evenings. There is a sun terrace with loungers, a Jacuzzi and day beds. Your little ones can learn new things as they play, make friends and try activities for the first time. 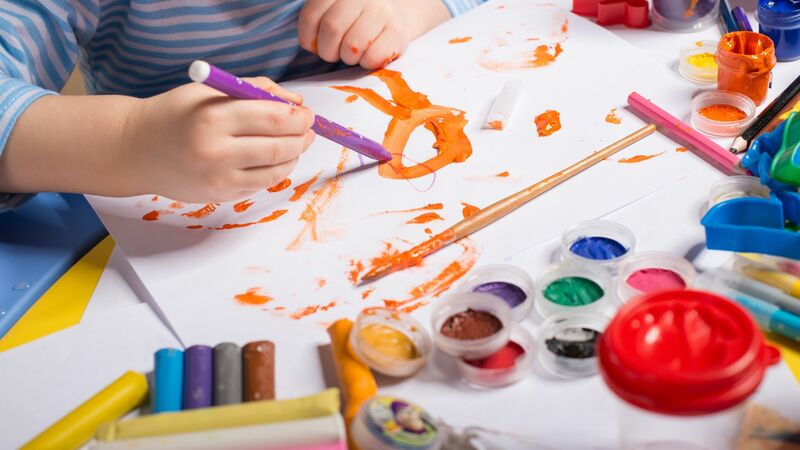 Expert staff are on hand to arrange activities including arts and crafts, film evenings, games and more. Sports, team games and more are organised by the expert staff who will keep your little ones entertained all day. 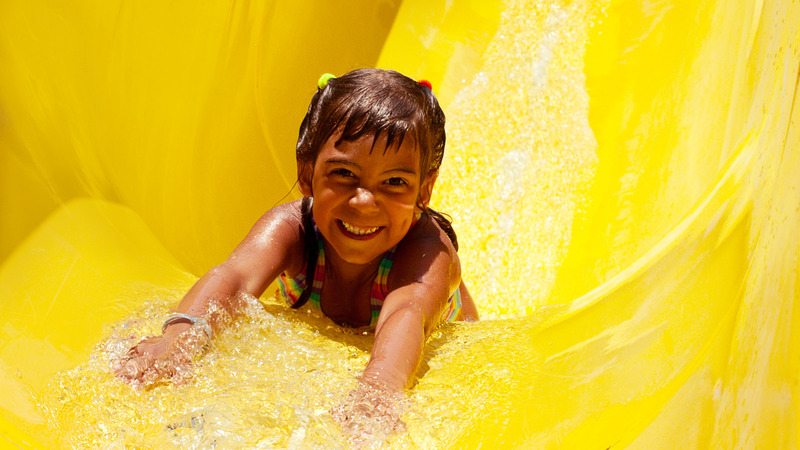 Older children will be kept entertained throughout their stay with water sports, evening parties and more. Mini buffets and specially designed children’s menus will ensure your little ones can try something new, as well as enjoy classic favourites from around the world. Leave the spa feeling relaxed, refreshed and rejuvenated after a range of treatments, including facials and massages. Couples treatments are also available for the perfect romantic break. Keep fit and active at the hotel’s onsite gym where you can choose from treadmills, bikes, cross trainers and free weights. WiFi, flat screen TVs, and music will keep you entertained while you work out. Guests can enjoy a range of water sports which are available from the beach in front of the hotel. These include pedalo rides, canoeing, and scuba diving trips. Experienced staff lead sports and activity classes onsite, including gymnastics and aerobics. Table tennis and mountain biking are also available. Grecotel Caramel Boutique can be found on the north coast of Crete, in the town of Adele, which is near lively Rethymnon. Adele is a little town steeped in traditional Greek culture, with beautiful views from its cobbled streets which wind up into the hillsides. It’s home to the idyllic whitewashed architecture and local churches Greek villages are known for, with some excellent restaurants on offer. Rethymnon is just a 15-minute drive away and is home to a spectacular harbour dating back to the Venetians. It has plenty of bars and restaurants, as well as boutique shops and places where you can pick up souvenirs and gifts. Caramel Junior Suites are located in the main house. They feature an elegantly decorated bedroom with a sitting area, spacious bathroom and dressing area. Facilities include air conditioning, complimentary WiFi, satellite TV, DVD player, mini bar, tea and coffee making facilities, safe, hairdryer, luxury bathroom amenities, bathrobes and slippers. Guests staying in this room will also receive the 'Famous Class Service' including express check-in and check-out, Champagne, fresh fruit juice or a traditional refreshment on arrival, two complimentary à la carte dinners per week at selected restaurants, access to a private beach area, complimentary cool beach drinks and snacks and resort beach bag with towels and beach accessories. Open Plan Junior Suites Private Garden are located in the main house, on the ground floor amongst mature gardens. Situated close to the pool, these rooms feature a distinct sleeping area with king-size bed, open-plan living area, furnished covered veranda and private garden. Open Plan Junior Suites Sea View are located in a prime elevated location in the main house with beautiful sea views. These rooms feature a king-size bed, seating area, bathroom, furnished covered balcony and sun terrace. Family Suites Main House are located in the main house with views over the gardens. These suites consist of a master bedroom with en-suite bathroom, a living area separated by a sliding door with two sofa beds and an additional bathroom and a large balcony with outdoor furniture. Open Plan Bungalow Suites are located on the ground or first floor of the bungalow suites amongst mature gardens. The accommodation features an open-plan bedroom with king-size bed and a living area, a spa-inspired bathroom and a spacious furnished veranda or terrace. Luxury Bungalow Suites are located on the ground or first floor of the bungalow suites amongst mature gardens. Ideal for families, these luxury suites feature a master bedroom and a separate living room with two sofa beds, both with direct access to a large bathroom and a spacious furnished veranda. Two Bedroom Beach Villas are located on a prime stretch of sandy beach with beautiful sea views. Villas feature an open-plan living area, master bedroom suite on the ground floor and second master bedroom suite on the upper floor. Some villas have one bathroom and others have two. Outside, there are fully furnished balconies and spacious verandas. Three Bedroom Luxury Villas are split over two floors and are perfect for families or large groups. The ground floor features a lounge and living area, dining area and master bedroom with a king sized bed and spacious bathroom. Upstairs, two king sized bedrooms can be found as well as a furnished veranda. Some villas have direct access to the beach and some villas have a private courtyard with pool. Four Bedroom Villas Seafront are set in a convenient and private location within the resort. Split over two levels, the ground floor offers a spacious open-plan living and dining area with a private veranda. Upstairs three double bedrooms can be found. The villas have direct access to the beach and have magnificent views of the ocean. Save up to 10% discount on the hotel price when staying in any Junior Suite or Suite for holidays between 21 -27 April 2019. This offer must be booked by 07 May 2019. “ Amazing costumer service, great food, relaxing beach just at your front door! Spent about a week with about 16 of our family / friends in various suites and villas (thank you for the thoughtful and kind upgrades for our honeymoon suite and the parents of the brides!) at Caramel as our ?? ?home base??? for wedding operations. Our actual venue was up the road at Agreco Farms - which is part of the same group (and whose delightful organic products are in the suites / restaurants) ??? also amazing! The hotel was fantastic from before arrival and through our whole stay. Concierge was extremely helpful with helping us and our planner book additional items like hair and make up, spa, shuttles to dinner for large groups, and even loaned us a few DVD?? ?s for a quiet night in once. The beach, pool, and grounds are heavenly. The staff is so friendly, from the restaurant to the cleaning staff. The surrounding area is less thrilling - but there are sights to see in Rethymno town - historical, dining, wandering around... but with this sort of stay you want to relax in the comforts of your hotel, right? And relax you definitely can here. A good value and worth it to stay with this highly professional and well run establishment. Thank you! This is the second time we stayed at the Caramel. We were greeted personally by the new manager and assistant manager and given a room upgrade, which was gorgeous and came with a jacuzzi on the balcony which was fab. Everything first class as usual, the staff, the food, the rooms and the beautiful pool. Cannot recommend this hotel more. They do 5 star on every level. We have recently returned from 14 wonderful nights in this excellent hotel. First impressions were good when arrived late, following a delayed flight. As we entered through the gates the atmosphere was of calm sophistication. Check in was dealt with quickly and we were shown to our room where there was a plate of fresh sandwiches, a plate of fruit and abottle of wine. ROOM There are lots of different styles of room.Ours was a garden suite which had a lovely comfy bed and a sitting area and a private terrace that overlooked our own garden space. The room was spotlessly clean and maintained daily to a very high standard. Also each night the room was serviced by a delightful lady. FOOD We stayed Half Board, with the intention of going into Rethymnon every other evening. But we were so impressed with standard of the food we only ventured out on 3 evening's. We generally do not like buffet restaurants but the amount of choice and standard at the Caramel is excellent. Added to which they also have a really good a la carte restaurant. The breakfasts were also very good with great choices,including sheep's milk yoghurt for those who are lactose intolerant. STAFF/SERVICE This is definitely one of The Caramels major assets. All of the people we encountered were so friendly and helpful. Nothing was ever too much trouble. An example of their efficiency is that one night we had a violent thunderstorm and torrential rain. In the morning we found that water had leaked into our room through the window. We reported this to reception on our way to breakfast. Cleaners and maintenance had sorted out the problem by the time we went back to our room. Many other reviewers have mentioned the maitre' d and I confirm that 'Oggy' is indeed an outstanding character who has the ability to judge how to interact with so many different sorts of people. He made us feel very welcome POOL/BEACH The pool is spectacular. It looks even more impressive when lit up at night. We spent most of our time at the beach. There are plenty of beach beds that you do not need to reserve , although we did see some people going out early to get their position in the front row. Yes,the entry into the water is rocky but a pair of beach shoes overcomes that. Overall I would highly recommend this hotel. Thank you all at the Caramel for a wonderful holiday.